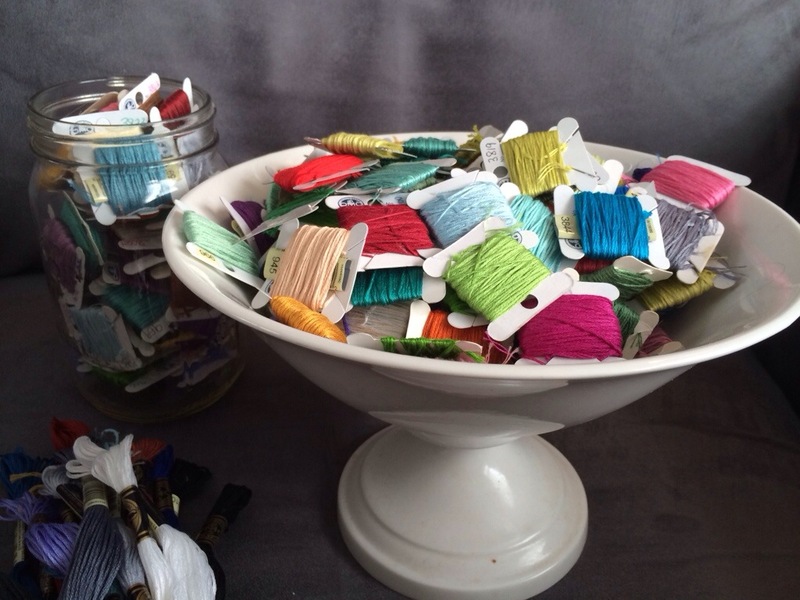 So I’ve started making a list of 2014 goals, and one of the items is to get my thread organized and to acquire all 454 DMC thread colors. Usually when I go to the store to grab a color for a project I grab a couple extra colors too. They’re only $.37, how can I pass them up? Well, I started noticing that in doing so, I gravitate towards the same colors. So I downloaded the app XFloss and I’m slowly going through and cataloging all of my current thread. Then I can look at what I don’t have and make a shopping list. I also started wrapping my thread a new way. 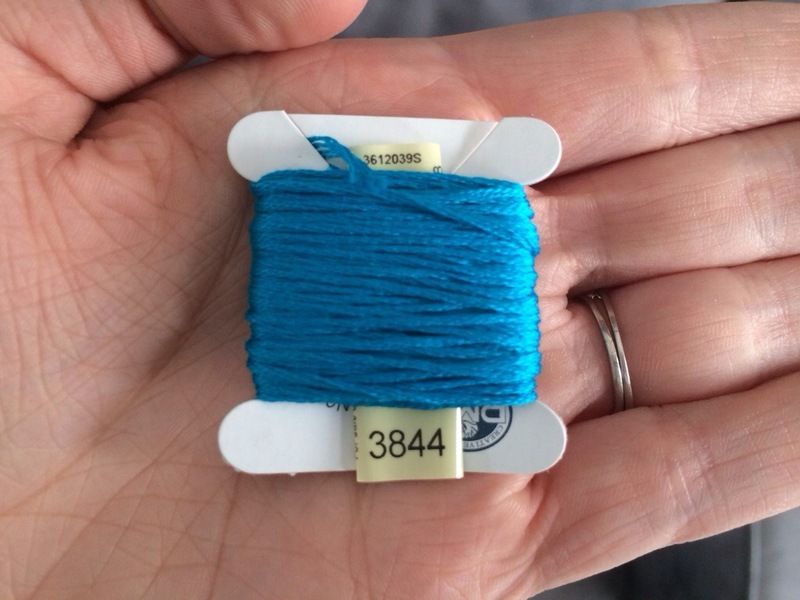 I used to always write the number on the cardboard bobbin, but I saw some people on Instagram who just slipped the wrapper with the thread number sticking out. I thought it was brilliant, so that’s my new method. In between all the Christmas presents I’ve been making, I have been winding bobbins and inputing what I have into XFloss. So far my inventory has 135 colors, and I’ve only gotten through about 1/4 of my collection. I’m curious to see what the final total is! Do you have a special way to organize your thread? Do you find yourself buying the same colors over and over? Right now I wrap my floss like you do (except I’m still writing the number down myself) but I recently heard of the Stitchbow system and I really like the look of it. I asked for the supplies for Christmas! Oh very cool, I was just looking up the Stitchbow system. I’ve seen the holders before, but I have never seen the storage options. Super cute! They have a tab to hold the number. You just slip the number on the floss holder before you wind up the thread. I’ve always used the little bags that you keep together on binder rings. I never understood those little plastic or cardboard bobbins. What do you do with leftover thread? It seems like small pieces would always be coming unwound and winding new thread onto them in the first place seems like a pain. The bags keep all the little leftover pieces that you don’t want to throw away yet in one place and you don’t have to go through the initial winding onto spools, you can just use it directly from the skeins. They also protect the thread better and keep it clean, which is a big deal for me since I have pets and fur always finds its way into my projects. I didn’t even realize the bobbins existed until I ran out of empty bags from my mom’s huge collection and went to buy more a few years ago. The bags seem harder to find than they were several years ago, like they’re being replaced by the bobbins. Vanessa, I don’t think I’ve ever seen those bags before, but they seem nice. I don’t mind the winding onto the bobbins though. If a piece of thread is big enough to keep to stitch with later, I just wind it back onto the bobbin. Otherwise if it’s too small to wind, it’s probably too small to stitch with. I use the plastic version of those cardboard bobbins, I hated the cardboard ones because just wrapping the thread on would bend them and cause problems. I also re-wrap it onto the bobbin, and if it is too short for that, it goes in my ORT tin. That’s a good idea to take the label with you. My husband is actually making me an iPhone app right now to track my floss collection. I have a few but I haven’t really loved any of them. It’s funny when I was organizing the threads to see which colors I was most drawn to. I absolutely love 964 and I have about 8 bobbins of it because apparently I always feel the need to buy more! Sometimes I tape the labels to my shopping list so I do not lose it in the domestic black hole that eats socks, cat toys and floss labels. 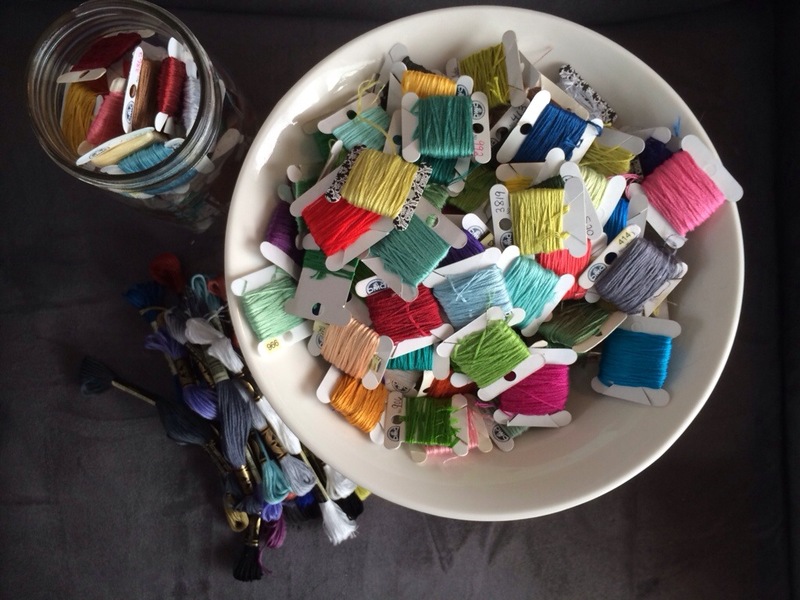 I thought about keeping all of my unused floss on bobbins, but even with just one of every color I would have a stack of boxes, and I don’t have storage space for that. That is why I keep my extras in skeins in the drawer. I don’t want a phone app for that, but I do have a spreadsheet with the colors organized on it by family. I use the DMC plastic bobbin box to hold my floss in. I use the plastic bobbin and the sticker numbers to identify them. I don’t have a lot of floss so this works for me. For regular colors (green, red, black) I keep them in the skeins and in a small plastic bin. Have you had any problems with the stickers falling off? I have a small pouch of unidentifiable colors because the stickers fell off! So I like putting the actual wrapper with them now. I’ve had stickers fall off, too. I use a fine point sharpie to write the numbers on.